HeriotAV are a family run independent audio visual company established in 1973. We supply, install and maintain high quality audio visual equipment to public and private sector organisations. Our aim is to offer audio visual solutions based around the very latest technology and products and to deliver them to the very highest standards. With over thirty-five years experience, we are one of Scotland’s most established independent agents for Audio Visual Equipment Sales, Service and Production, we also undertake Videoconferencing / Voice / Data / Fibre / Electrical / CCTV and RF installations including satellite and aerials. We are one of only a few companies in the UK with the diverse skill set that our team bring to the workplace. 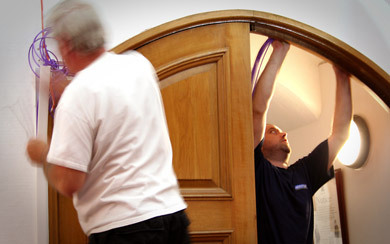 We offer a full range of maintenance and support packages tailored to your needs. Highly qualified staff regularly check and test our installations to keep them up-to-date and fully operational. We provide expert technical training on all our products and installations, empowering the customer with a comprehensive working knowledge of our products so should you encounter any difficulties, troubleshooting becomes a logical step by step exercise. Our friendly support staff provide a “round-the-clock” service to ensure that if you do encounter any problems, technical or operational, solutions are just a phone call away. We are authorised dealers for leading brands including Panasonic Broadcast, Sony, Kramer Electronics, AMX & Extron. Our excellent relationships with all our suppliers enable us to source the very latest equipment. Our contracts range from local government and corporate communications to broadcast equipment supplies, maintenance and service support.